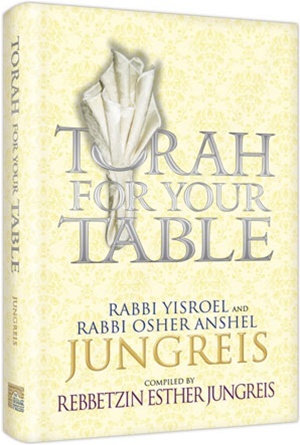 Central to the life of the Jewish family is the time they spend together around the Shabbos and Yom Tov table -- a warm and convivial setting that invites conversation and the exchange of thoughts and ideas. Yet words alone do not make for an elevated Shabbos experience; when the discussion around the table is mundane and inconsequential, the experience is rendered similarly meaningless. But when the “table talk” is enhanced by Torah ideas that can be applied to daily life, then even the most simple meal becomes a vehicle for personal growth and transformation.